How can I get rid of flying ants? Why do ants fly and what are flying ants? Swarmers have wings, unlike all other ants in colonies so that they can glide far away instead of crawling to a new nesting destination. They are in charge of finding a new nesting site, and then being the first to reproduce and build up the new colony. If you see flying ants swarming, this means that the colony has been maturing and did not manifest recently. *It is important to note that a “flying ant” is not its own species. Flying ants are a type of ant that serves a single function to extend the life of their colony. Citronella ants, pavement ants, odorous house ants, and carpenter ants are the most likely to swarm in the New Jersey and Pennsylvania area each year. Is it a termite or a flying ant? Flying ants and termite swarmers look very similar due to their size, color, and wings. The impact of a flying ant invasion versus a termite infestation is great. Termites cause significant damage to your home whereas flying ants will not create structural damage. This differentiator makes it much a more urgent situation to resolve. Naturally, it’s imperative to know how to spot the differences and act accordingly. Photo Credit: Home Pest Control of Midde TN, Inc. Flying ants have a long, narrow, segmented waist. They have two wings on each side of their body of unequal length with the longer wings toward the anterior of the ant, which can be clear or smoky in color. Flying ants have bent antennae that make a field goal shape. Termites are very similar to flying ants because of their size and wings. Unlike flying ants, termites have two wings on each side, all of equal length. As termites land on the ground, their delicate wings break off, which is not the case for flying ants. You can tell that a termite swarm has happened when you see piles of opaque, waxy looking wings around your home. Their waist is broadly joined with straight antennae. Both insects are broken down into separate and rigid castes, meant to serve various functions in a single colony. Flying ants and termite swarmers serve the purpose of reproduction in an effort to create a new colony. 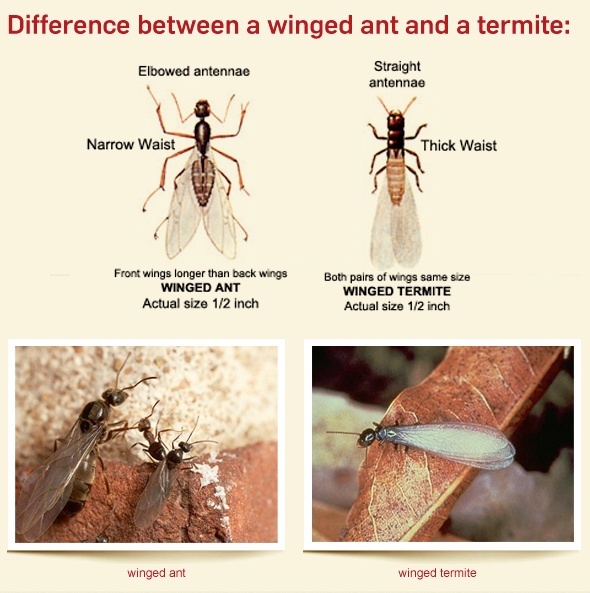 To learn more about termite and flying ant identification, read our blog post here. 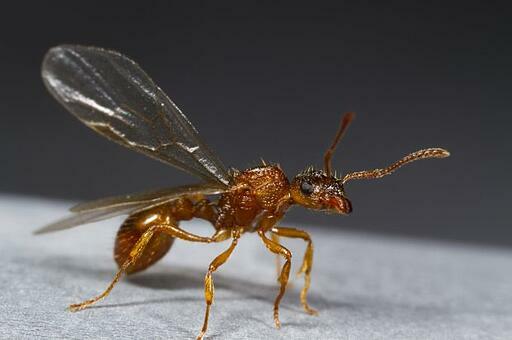 Controlling the flying ant population at your home can be challenging to do on your own. Once a swarm begins, flying ants will emerge in as many as hundreds of thousands. Fortunately, this typically only lasts for a few hours to a few days and then ceases. The goal of flying ants is to use their wings to leave the colony and reproduce. Swarming does not happen frequently, so pest control companies will focus on preventative rather than reactive services. You can vacuum up flying ants and dispose of them as they are visible. Flying ants are likely to enter your home through cracks and crevices around your home including open windows and around your basement. Your best defense against any type of ant is to seal up these areas and keep your kitchen counter and floors free of crumbs. Without an entry point or a food source, ants will find your home less appealing. Where can I find a flying ant service near me? Flying ant services are available to clients in all of the counties listed above. Once a flying ant swarm begins it doesn’t last long. Although Cooper can provide effective ant control services, baiting systems used by Cooper and in the pest control industry will not stop the flying ant swarm in time. They burst out of the colony like champagne out of a champagne bottle and stop once the fizzy drink runs out. Cooper provides one-time as well as year-long ant control services that can prevent the swarm from taking place before it even happens. A one-time treatment can be applied directly to active ant colonies in your home with our One Time Ant Service which provides coverage for 90 days with unlimited service calls. This program is reactive as opposed to our Home Services which are proactive. If you are worried about flying ants, it is more beneficial to invest in a Home Service to stop flying ants before they occur. Our Home Traditional and Home Intensive Services are year-round programs that provide monitoring and control treatments proactively. If you see ants within the duration of the year, you will have unlimited, free service calls with a technician dispatched promptly. Home Services give you peace of mind that conditions that encourage swarming activity are eliminated and prevented. If you have a current ant problem at your home please give us a call at 1-800-949-2667 or fill out the form on our website.